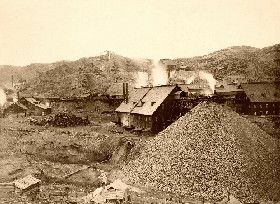 Homestake Mine, South Dakota 1889. The largest underground gold mine is the Homestake Mine in Lead. Tours are available today telling of the area and the mine’s rich history. The Mammoth Site is of great scientific importance due to the primary (actual death area) accumulation of mammoth bones at the site. Most fossils are found where they have been deposited by stream beds or carnivores. Visitors to South Dakota’s Badlands National Park will find fossil evidence of 35 million years of evolution – a dog-sized camel, three-toed horse, and saber-toothed cat. Movies that show police officers being struck, beaten, or treated in an offensive manner are forbidden in South Dakota. Fossilized remains of life 50 million years ago have been arranged in unusual forms, which is Lemmon’s mark of distinction at the world’s largest petrified wood park. Pierre, South Dakota is the only example of a state and capital in the U.S. that don’t share any letters. Built in 1832 by John Jacob Astor’s American Fur Company, Fort Pierre Chouteau was the largest and best-equipped trading post in the northern Great Plains. South Dakota has one of the largest Native American populations, with nine official tribes and some 60,000 people. Internationally famous, the Sturgis Rally and Races, held during the first full week of August, welcomes motorcyclists from all parts of the world to tour and show their skills competing in the hill climb and racing events. Throughout the years, the Rally has grown into a 15-day premier event with the attendance of more than 650,000 racers, visitors, and celebrities! Clark is the Potato Capital of South Dakota. It is also the home of a Mashed Potato Wrestling contest. One of Keystone’s claims to fame is that Carrie Ingalls, of Little House on the Prairie lived here most of her adult life. The Badlands are known as “the playground” of the dinosaur. The youngest person to ever be elected to the South Dakota Legislature was Justin Davis, who was elected to the House of Representatives in 2002 at 24 years old. Famous South Dakotans include newscaster, Tom Brokaw, Calamity Jane, Sitting Bull, and Crazy Horse. The Black Hills of South Dakota hold two national caves: Wind Cave National Park and Jewel Cave National Monument. Jewel Cave is presently the fourth largest cave in the world, with 57.4 miles of surveyed and mapped passages. 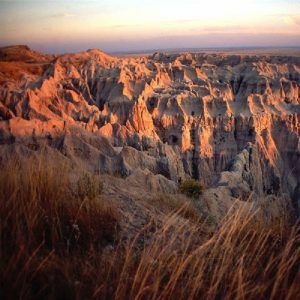 The name “Black Hills” comes from the Lakota words Paha Sapa, which mean “hills that are black.” Seen from a distance, these pine-covered hills, rising several thousand feet above the surrounding prairie, appear black. Belle Fourche is the geographical center of the United States of America, designated in 1959 and noted by an official marker and sheepherder’s monument called a “Stone Johnnie”. Wild Bill Hickok was killed in Deadwood, South Dakota in 1876. He is buried there in the cemetery. South Dakota adopted the honey bee as the state insect in 1978. Mitchell, South Dakota is the home of the world’s only Corn Palace, built with 3,500 bushels of ear corn. Drilling began on the four faces of Mount Rushmore National Memorial in 1927. Towering 6,200 feet, the faces of George Washington, Thomas Jefferson, Theodore Roosevelt and Abraham Lincoln are scaled to men who would stand 465 feet tall. Sculptor Gutzon Borglum originally planned to include a Hall of Records behind the faces but never completed the project. Creation of the Shrine to Democracy took 14 years and cost a mere $1 million, though it’s now deemed priceless. Towering over the Black Hills at an elevation of 7,242 feet, Harney Peak is the highest point east of the Rocky Mountains. Clark is the Potato Capital of South Dakota and is also home to the world-famous Mashed Potato Wrestling contest. South Dakota is the home of the Dakota, Lakota, and Nakota tribes, which make up the Sioux Nation. A prospector in the Black Hills named a promising claim after his neighbor’s daughter, calling it “The Little Allie”. The prospector’s wife got angry because he had never named a claim after her and she demanded that the mine be renamed in her honor. The prospector agreed and renamed the mine “The Holy Terror” which is what it is still called today.